LeAnn’s Gourmet Foods, a Georgia-based, woman-run company, offers a range of local, all natural, gluten free relishes, pickles, jellies, jams, butters, dips and mixes. Simplicity, because who doesn’t like the simple things in life? That is certainly something indicative of the South and is exactly what LeAnn’s Gourmet Foods, a company out of McDonough, GA, seems to incorporate in its delectable items. A simple family recipe made with simple ingredients is what jump-started this line of delicacies. Two friends, Tracy North and Michelle Pyrtle, built their company in order to share an old family recipe with the rest of the world. From that one treasured recipe, others were inspired and created by Tracy and Michelle, using all natural and gluten-free ingredients. 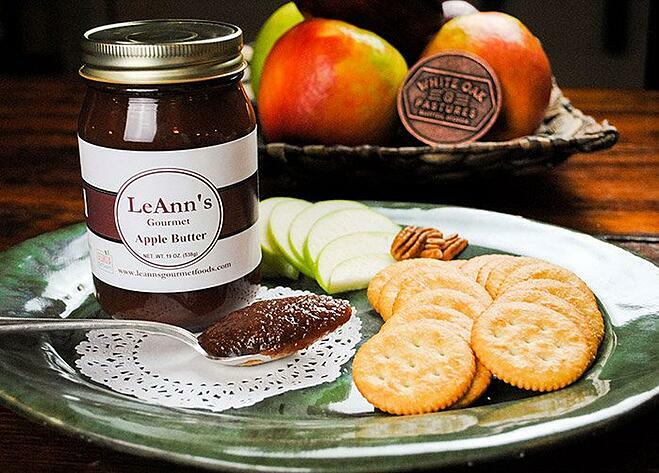 Our customer favorite- Apple Butter, pairs great with fruit and crackers. One such item is their Corn Relish. Made with corn, onions, and peppers, this relish will add a savory flavor to any burger or hotdog at your next cookout. But don’t think the possibilities end there. It can also give tacos, chili, beans and rice, along with sausage a creamy, flavorful taste. LeAnn’s Gourmet Apple Butter, a favorite among our customers, is made with apples, apple cider vinegar, sugar, cinnamon, and other spices that blend together to make a delicious spread for your tried and true toast and crackers. However, if you are looking to add a new dimension to main dishes, LeAnn’s Gourmet Apple Butter is perfect for your White Oak Pastures’ pork loin and pork chops, but don’t stop there! A little creativity can lead to Apple Butter Bacon or Turkey Cheddar Apple Butter Panini using White Oak Pastures’ pastured hogs and poultry. For simpler dishes, pair it with breakfast biscuits, sweet potatoes, or an ice cream sundae dessert! LeAnn’s Pear Relish can be used alternately with these dishes as well. 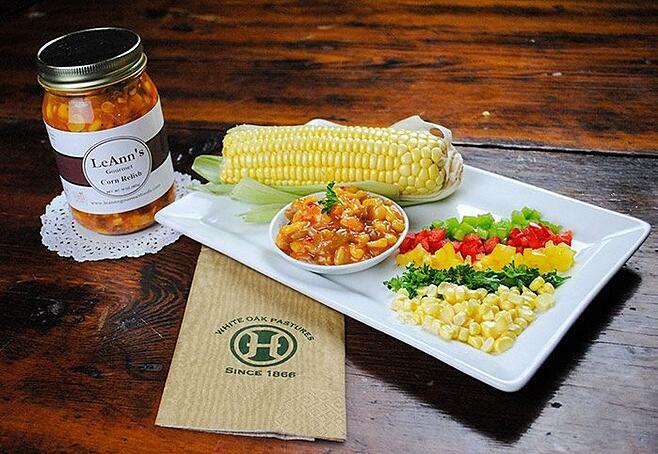 Corn relish makes an amazing topping for dishes such as burgers, hotdogs, tacos & chili. Lastly, but certainly not least, LeeAnn’s Pickled Okra and Vidalia Onion Honey Mustard fit right into the southern menu, but we’ll share with our friends! 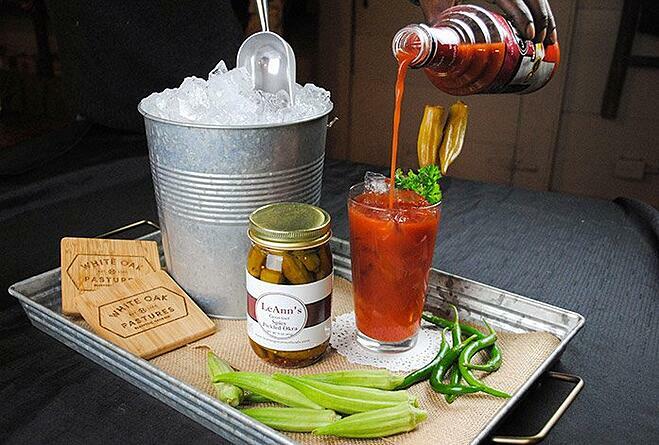 You can surely spice up a Bloody Mary or replace that olive in a Martini with LeeAnn’s Pickled Okra. If you prefer an entre’, chop the pickled okra and use it in tuna or chicken salad made with White Oak Pastures’ pastured chicken, or inside a grilled cheese sandwich. LeeAnn’s Vidalia Onion Honey Mustard makes an easy meal when cooked with chicken and potatoes in the same skillet. White Oak Pastures’ pork, bacon, or chicken breast are all favorites when paired with LeeAnn’s Vidalia Onion Honey, but don’t forget that it adds so much flavor to a dinner or side salad as well. 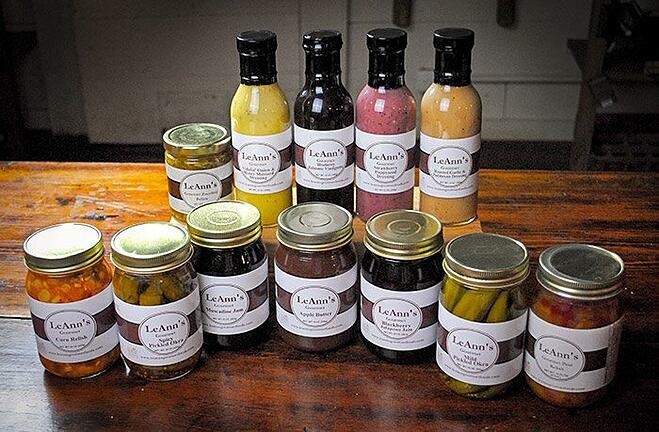 LeAnn's products bring a vibrant pop of color and flavor to our General Store shelves. White Oak Pastures is proud to offer these delicacies in our General Store in Bluffton, Georgia. While LeAnn’s Gourmet Foods offers other relishes, pickles, jellies, jams and butters, along with several other dips and mixes, we have our favorites and love using them with our grassfed, pasture-raised beef, pork, chicken, turkey, ducks, guinea, goats, and lamb. We carry LeAnn's Gourmet Zucchini Relish, Vidalia Onion & Honey Mustard Dressing, Muscadine Jam, Blueberry Balsamic Vinaigrette, Strawberry Poppyseed Dressing, Roasted Garlic & Parmesan Dressing, Blackberry Jalapeno Jam, Mild Pickled Okra, Spicy Pickled Okra, Apple Butter, Gourmet Pear Relish, Corn Relish. 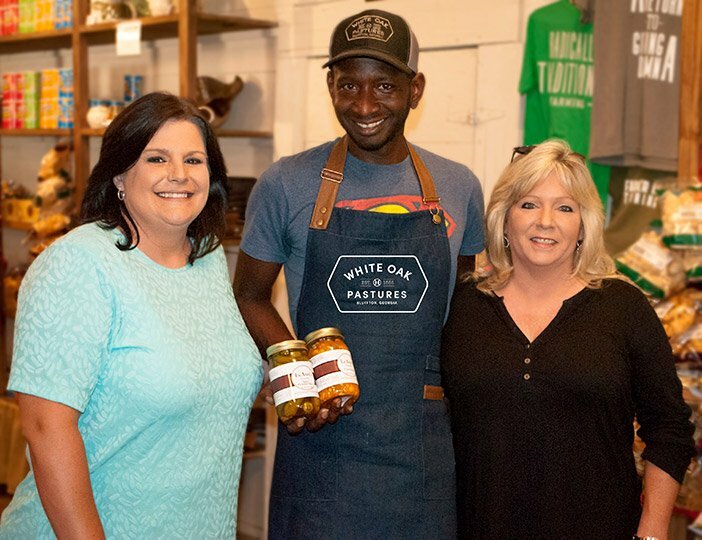 Visit our White Oak Pastures’ website to order everything you need to prepare your own gourmet meal, or drop by our General Store to see all the other truly unique items we have to offer! Chad Hunter, our General Store Manager, with LeAnn's founders Tracy North and Michelle Pyrtle when they visited our farm.